How To Make The Best Potato Salad Recipe you’ve ever tasted! My mom’s potato salad is better than your mom’s potato salad. Seriously though, my mother has magical abilities in the art of potato salad making. My mom makes traditional mustard, pickle, and hard-boiled egg potato salad. It’s simple, but I have never made or tasted another potato salad better than her version… And I’m not the only person to think so. Over the years I’ve watched countless relatives and friends swoon over here classic potato salad. The problem is, when you ask her for the recipe she has a hard time sharing it, because she doesn’t actually have a recipe written down. She makes it by feel. It’s taken years of watching, assisting her, and asking questions to come up with what I consider to be her recipe. Want to know mom’s secrets? 1) The key to making the best potato salad is to use starchy potatoes and let them get really soft, so they are partially mashed once mixed. This gives the potato salad a rustic, yet thick and luxurious quality. I like to use Yukon Gold or Klondike Goldust potatoes. Do not use new potatoes, because they hold their shape too well and will leave the dressing soupy. Start the potatoes in cold water and bring them to a boil to ensure even cooking. Make sure to salt the boiling water so the salty flavor gets deep down in the potatoes. Once the potatoes are soft, drain off the water and peel off the skins. You can leave some of the skins on if you like the added texture. Chop the potatoes when they are soft; this saves time on the peeling and chopping. 2) Next, mix all the dressing ingredients together. Use your favorite mayonnaise as the base. I know better than to tell you what brand to use… Mayonnaise is an intensely personal condiment! Here in the Carolinas, we use Duke’s Mayonnaise, but mom usually uses Hellmann’s. You can even go with Miracle Whip if that is your favorite. Mix a large amount of sweet pickle relish into the dressing. Use the refrigerated kind that tastes fresh and stays firm. If you can’t find it, finely dice firm refrigerated sweet pickles instead. Make sure to use yellow mustard for flavor and color. Sometimes mom adds half yellow mustard and half dijon mustard, but if it’s going to be one or the other, you have to use classic yellow mustard. Apple cider vinegar, celery seeds, and a little bit of paprika round out the dressing flavor. 3) Mix the potatoes and the dressing while the potatoes are still warm. 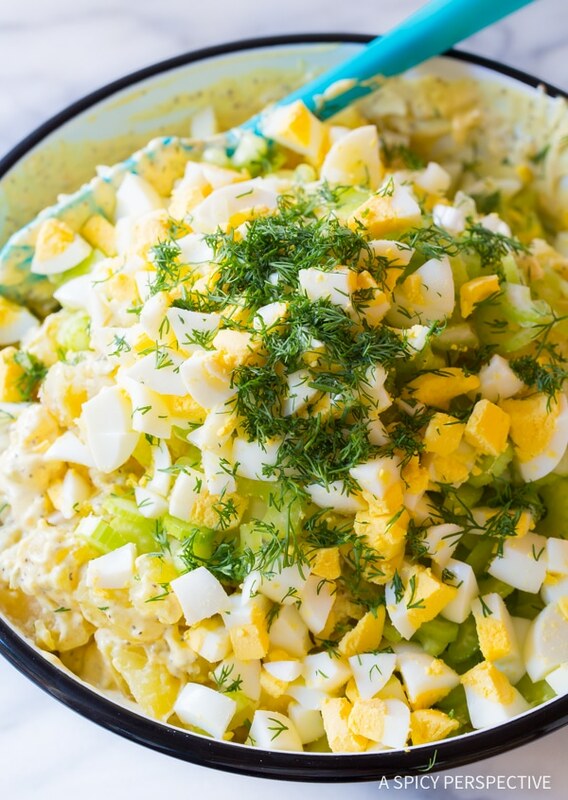 Add chopped hard-boiled eggs for richness, celery for crunch, sweet onions for a zippy bite, and fresh chopped dill for a herbaceous punch. The onions are a point of discrepancy in our family… Personally, I would always choose scallions over any other raw onion. However my dad insists on raw chopped sweet onions for crunch and flavor, so that’s what mom uses. To his credit, they do provide a more potent onion essence and crisp texture when serving on the second or third day. 4) Finally, potato salad, any potato salad, tastes better on the second day after the flavors have had ample time to mix and mingle. When possible make mom’s potato salad the day before you plan to serve it. However, if you don’t have time to make it a day ahead, refrigerate the potato salad for as long as humanly possible before meal time. Get the Full (Printable) Recipe & Video For How To Make The Best Potato Salad Below! If you are determined to learn How To Make The Best Potato Salad Recipe, give my mom’s recipe a try. How To Make The Best Potato Salad Recipe. My mom's potato salad recipe is hands-down the best potato salad I, or anyone else who's tried it, has ever eaten! Cut the potatoes into quarters and place them in a large stock pot. 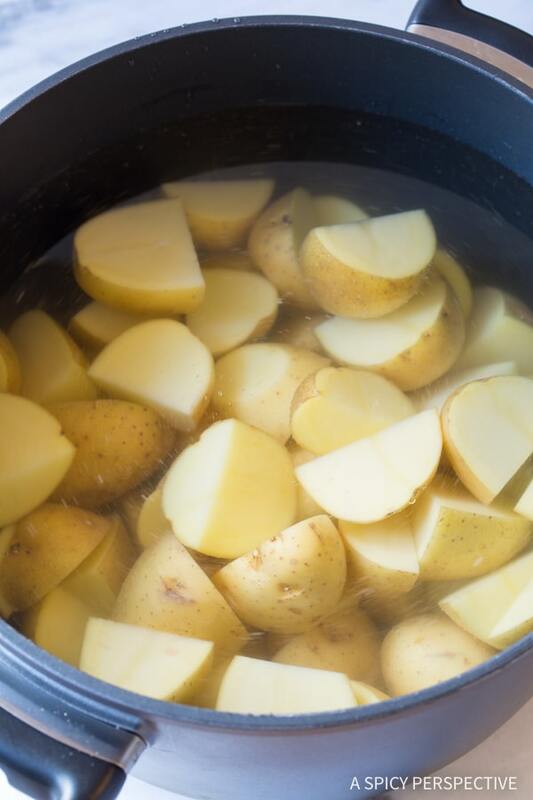 Fill the pot with cold water until it is 1 inch over the top of the potatoes. Set the pot over high heat and bring to a boil. 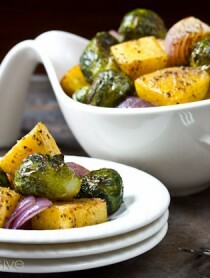 Once boiling, add 1 tablespoon salt and cook the potatoes for 13-15 minutes, until fork tender. 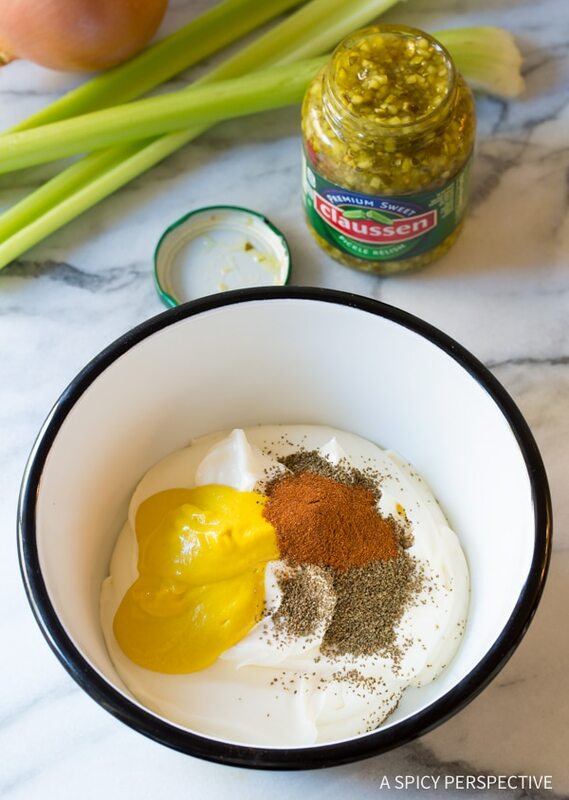 Meanwhile, in a medium bowl mix the mayonnaise, sweet pickle relish including juices, mustard, apple cider vinegar, celery seeds, paprika, 1 teaspoon salt, and pepper to taste. Stir until smooth. Then chop the eggs, celery, onions, and dill. Once the potatoes are very tender, drain off all the water. 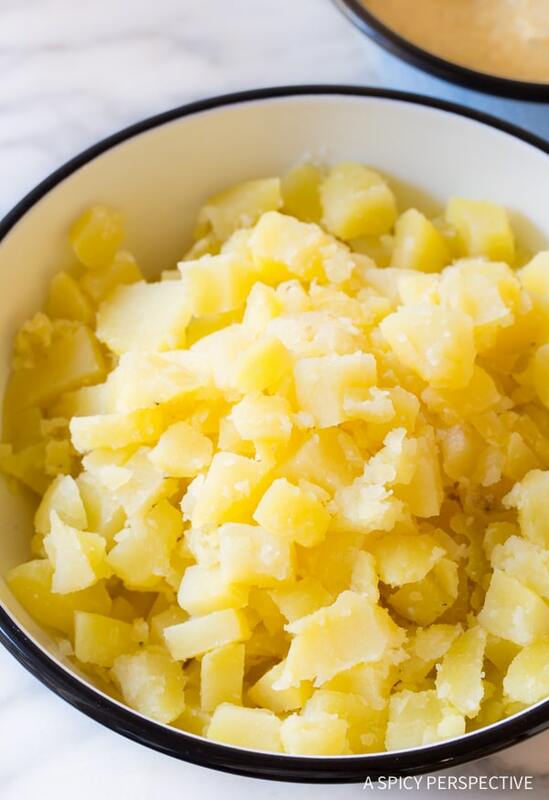 Remove the loose peels and chop the potatoes into 1/2-inch chunks. It's okay if they are soft and crumbly. Place the potatoes in a large bowl. Gently mix in the dressing until it coats the potatoes well. Then stir in the eggs, celery, onions, and dill. Taste, then salt and pepper as needed. Garnish with fresh dill and paprika. Cover the potato salad and refrigerate for at least 4 hours. If you have time to make it ahead, it tastes even better on day two! Keep refrigerated in an airtight container for up to one week. If you can't find golden potatoes, use russets. For best flavor, make your potato salad a day ahead. Holy Sweet Pickle Relish Moly! My hubby and I were gobbling this down while it was still warm. Perfection! Thank you SO MUCH for the world’s best potato salad! I made this exactly as instructed, but used russets and a deli style sweet pickle relish not refrigerated. Oh my! Hands down the best potato salad I have ever made, and I’m 65 years old. Ate it warm an hour after made, so good I can’t imagine how good it will be tomorrow. Thanks so much for sharing. My sister-in-law made it for our Easter potluck and I did a double back flip! Best potato salad I’ve ever had! That’s why I’m here now, saving the recipe. Thanks!!! Really delicious. This was like my mother used to make! This was so yummy! I did make my own mayo. All I had was dried dill, but it was still great. I will use this recipe from now on. Thanks! Great recipe! The relish was pretty sweet for my tastes, next time I’ll half it. Will make again! Love that you added dill! Looks so delicious. Haven’t made a good potato salad in a long time. Cannot wait to make this! Yum yum! Qiuck, easy and ih so tasty. This pitatis salad was a nice combo to my bbq ribs. Great potato salad recipe; made this for a family dinner and it was a hit! I also have a sweet spot for Duke’s mayo since I used to live in North Carolina (which they now sell at Wal-Mart here in Iowa!) I added about 3 tablespoons fresh dill and five finely-diced radishes, but those were the only things I changed. Thanks! Radishes?! GREAT IDEA! I’ll do it, too. Thanks! This really is the best with that sweet pickle relish! It was a huge hit!! My new favorite way to make potato salad! 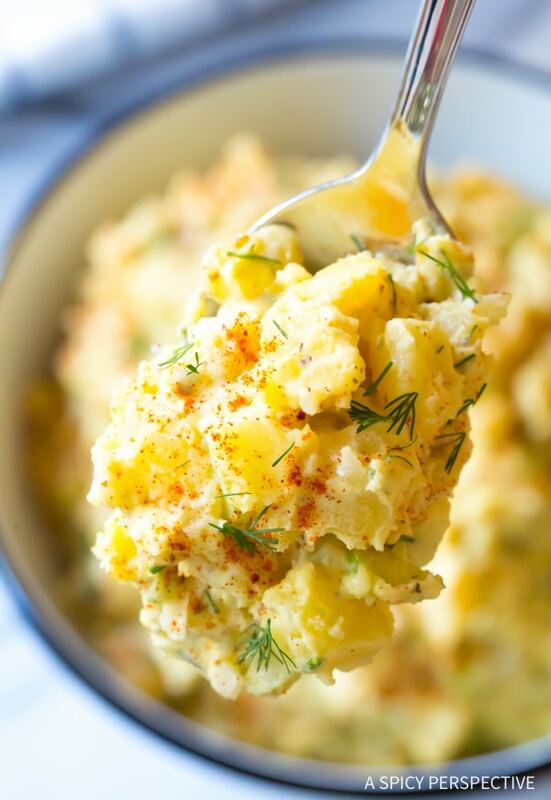 We love this potato salad! So delicious! Thanks for the fabulous recipe! This reminds me of my mom’s potato salad! Love that you added the celery seeds, too! Perfection. 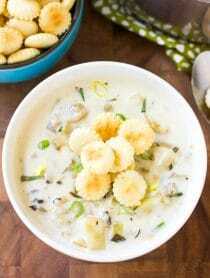 This is wonderful potato salad, creamy and complex in flavor. Perfect compliment to my gumbo. I followed the recipe pretty exact and used smoked paprika. Fantastic recipe! Couldn’t stop eating it! Definitely better after refrigeration for a day or two. Made a few changes as I didn’t have all of the ingredients. For example, I added chopped sweet red bell pepper (capsicum). Really delicious. I’ve used a few different potato salad recipes, and this is one of the best recipes. Just wondering how long this salad would keep in the fridge? Tried this recipe and really liked it! I cut the relish in half and still felt like there was plenty. I went with 4 eggs and wished I used 5. I’M trying this tonight for New Years Eve 2019 along side BBQ Beef Ribs and Crock Pot Collard Greens and Corn bread. Wish me luck. Happy New Years Everyone. Thank you for all of your help on this. I will keep coming back to it for some help. I literally just finished using your recipe for the potato salad. I am amazed because I never tried to make it. This is soooo good. Thanks for sharing. OMG. Delicious. Small change that was better suited for my preference. I used Dijon only and a smaller amount, just maybe a teaspoon of relish, a teaspoon of sugar. Didn’t have celery seed so I used a small amount of celery salt. Only made half the recipe with the other ingredients. Really good. I love to make different potato salad recipes. I have learned to boil or bake the potatoes whole. That way the flavor stays in & doesn’t get watered down. They are easy to peel & chop after they have cooled. I don’t like sweet relish, so I use dill pickles finely chopped. I like Dukes & Best Food Mayo & of course yellow mustard. I use more eggs & will add sliced black olives. Haven’t tried adding bacon. So easy to make and delicious! This looked so good I had to try it even though I was skeptical about the relish! It is the best potato salad I have ever made. Hubby loved it too! Our new normal. I made this for Thanksgiving, and everyone loved it. I personally have never liked potato salad, so I was a bit nervous to serve something that I could test first and make sure it was good, but everyone loved this potato salad! I made this for Easter dinner first time making potatoes salad and it was a hit. Everybody loved it. I am still hearing about how great it was. I made this potatoe salad for tomorrow’s dinner and is DELICIOUS. Thanks for the recipe. My wife was craving potato salad so after looking at a few different recipies I tried this one. It was really good! It is better the next day so make it a day in advance if possible. I added more mayo so it wasn’t dry. It definately is a classic picnic potato salad. I will definately make this recipe again. Thanks for your sharing!! This recipe is close to my grandmothers recipe. I grate my onions because some people in my family have issues with the diced onion. When I grate the onion they can’t feel them. Im going to try the recipe for a family get together. But I’ve never had potato salad and I’ve never made it. I got assigned potatoes🤷🏻‍♀️. Is it served hot, warm, or cold??? Yum! I’m a big fan of potato salad, and this was my favorite recipe for it so far! I added some red pepper flakes for a little extra kick! Thanks for sharing! This was delicious. I made it vegan by using a Helman’s Vegan Mayo and omitted the eggs. Sometimes I used pickle juice, sometimes vinegar. I like to add a tablespoon of siracha for some punch. Very good. This was really delicious and quick to make! I’m not even a big fan of potato salad, but wanted a good side for school days when I’m rushing between classes but also starving and in need of something of more nutritional value than a Cheeto. Thanks so much for sharing your mom’s recipe, it really is great. The dill is just lovely in this. I cut it down by about 1/4 and it made 4 (generous) servings for me. My Grandma thinks every one loves her potatoe salad. However I do not. She uses miracle whip and I can not stand miracle whip. I used your recipe with Dill relish and Best Foods Mayo it is delicious. I wish I cooked the potatoes a little longer but I know for next time. Going to have my son try both and see which one he likes better. Thank you. I didn’t have any mustard(!?) so I added two packs George Washington Golden seasoning. Spectacular! Not dry, perfectly seasoned. Winner!! 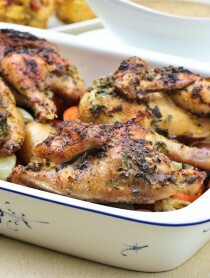 After making this recipe a few days ago we were able to try it tonight and it is a winner! 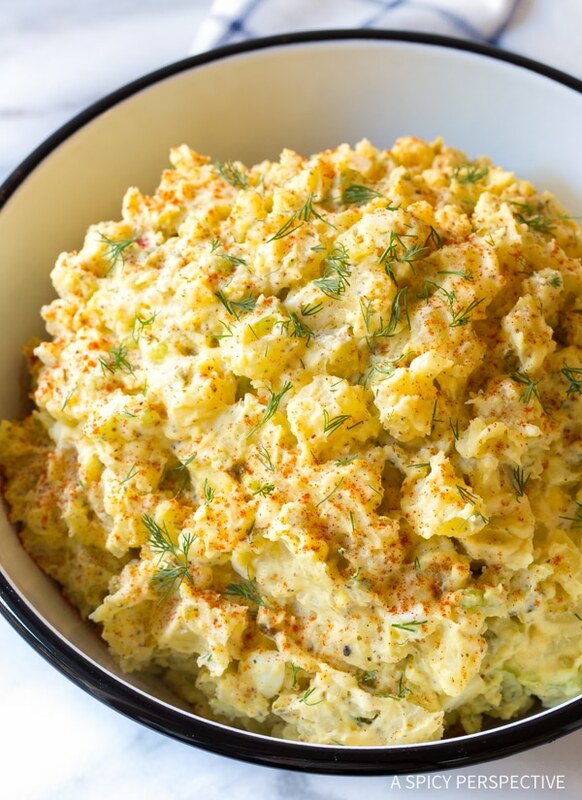 It reminds me of the potato salad that one of my aunts used to make for family get together’s and it was something I always looked forward to. My previous comment lists some of the modifications I made to it, but it is essentially what was in the original recipe. I did halve the recipe since it was only for my wife & I, but this will be my go to recipe from now on. I liked the sound of this recipe so decided to try it out to serve with a smoked pulled pork that I’m going to make in a couple of days. I halved the recipe & chopped up a quarter of green pepper that I had in my refrigerator. I’ve mixed the dry ingredients with the wet ones, diced the celery & onion, boiled the eggs, and placed everything in the fridge to cool down. Later today I’ll boil the potatoes and then mix everything together. This will give the potato salad a couple of days to meld all of the flavors. I did taste the mayonnaise mixture and it tastes wonderful. I didn’t have sweet relish so I used some dill pickle relish and I think it works well. I’ll let everyone know how the finished product tastes in a couple of days. No one in my family is a super big fan of the traditional potato salad, so I was looking for something with just a little more to it. This is it! A really a good mix of flavors. So happy I found it:D This will be my new go-to for potato salad. Thank you so much for sharing! Looks tangy I will venture a bowl.Thanks. I love, love, love this potato salad. It has just the right amount of tang to make it full of flavor. 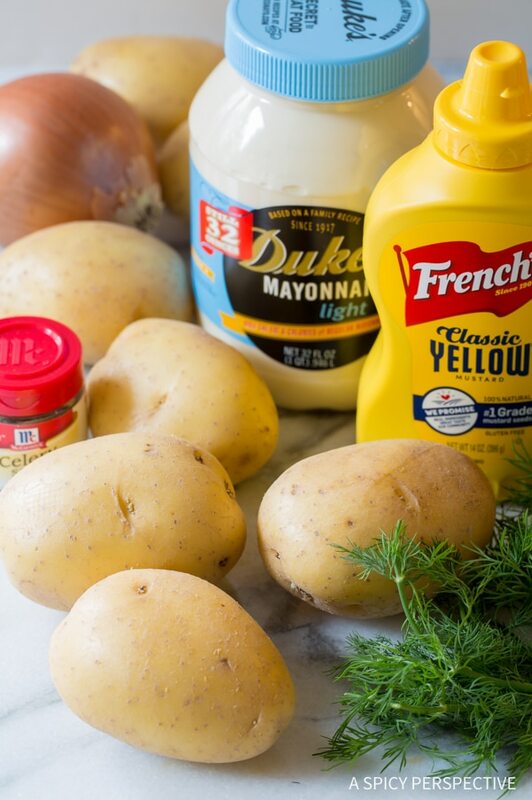 I used Yukon Gold potatoes, good ol’ Duke’s mayo, and regular yellow mustard. And yes, be sure to make it a day ahead. If you leave it out, like we do, it is still scrumptious! Do you have sweet pickles or “bread and butter” pickles available where you live? Sweet pickle relish is essentially sweet pickles diced into tiny pieces. Some relishes have diced pimento added in, but they are not necessary. Reduced the relish to a couple tbsp. it was the best I’ve had in a long time ! I Used Dill Pickles, 1/2 Cup It was Amazing! Wow, I can already tell this is the potato salad of my dreams. You had me at yellow mustard LOL. Thanks so much for sharing, I can’t wait to make this!! 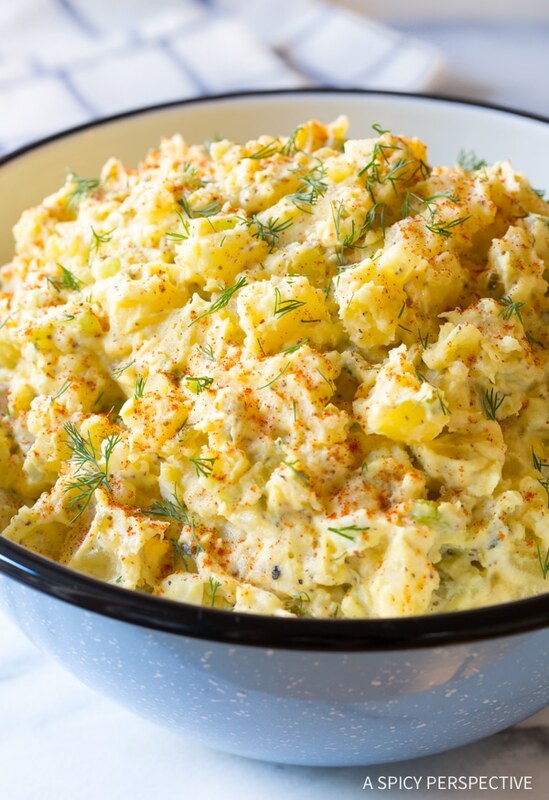 Potato Salad – nothing like a perfect summer dish! Your potato salad is very similar to my mother’s as well. I do like the finishing touch of dill, which I will try today, as I have a potluck tomorrow. I’m so tired of potlucks having potato salad from the local grocery store and the potatoes are so hard! I will be putting this one together today. BTW: Is it smoky or sweet paprika? 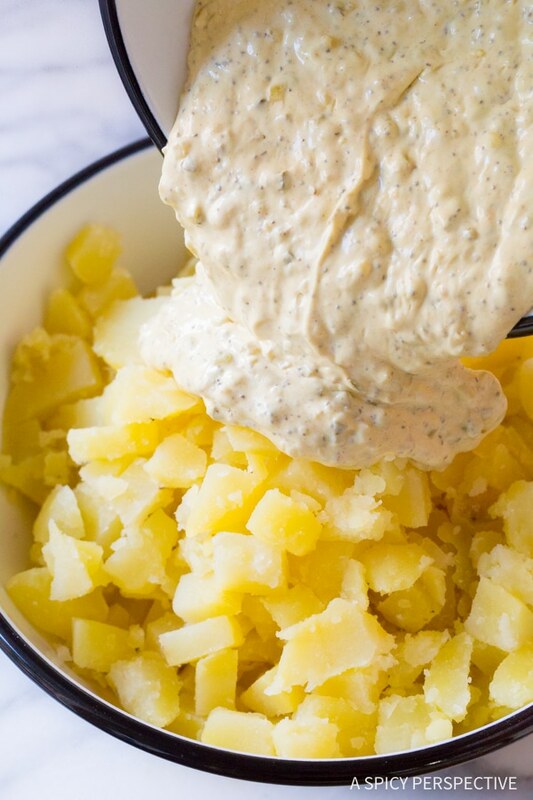 This potato salad recipe is a MUST try! Well, my Mom’s recipe is better than yours! LOL She uses pickle juice instead of the vinegar, she’s almost world famous! People love it and try to figure out the secret. I love it with apple cider vinegar as well! Well Sommer’s Mom uses pickle juice at times as well. I love dill in my potato salad!